On the one year anniversary of the signing of the Darfur Peace Agreement (DPA), there is no peace in Darfur. The two rebel factions that did not sign the agreement have fractured into many. Sudan’s ruling National Congress Party (NCP) continues to pursue a military solution in Darfur, and violence and displacement are on the rise. During the DPA negotiations, the Sudanese government agreed that a United Nations peacekeeping force would be free to deploy once a deal was signed, and so the international community, led by the U.S., pressed hard for a quick agreement. This strategy could not have been more wrong, and one year later the results are evident. The NCP has done everything in its power to prevent the UN deployment. It continues to pursue divide and rule tactics, as well as military solutions, evident in its most recent bombings of a rebel unification conference in the North Darfur town of Um Rei in mid-April. The NCP has also instigated a new wave of violence and destruction, with NCP-backed Janjaweed militias now attacking both Arab and non-Arab tribes in a quest to claim the land they believe is their reward for fighting on behalf of the NCP’s. At the same time, the NCP and some within the international community – including the U.S. and the African Union (AU) – are pushing for implementation of the DPA, an agreement that tens of thousands of Darfurians have vocally, and violently, rejected. The international community’s one-dimensional effort to gently persuade the government of Sudan to accept a more effective peacekeeping force – has failed time and time again, and now threatens to drown out an equally pressing need: an internationally accepted roadmap for a renewed peace process. Current diplomatic efforts to negotiate a durable peace agreement have been uncoordinated, allowing the NCP and the rebel groups to “forum shop.” This lack of coordination has also done little to encourage the rebel movements to reach the degree of political unity needed for a successful negotiated settlement to the crisis. In the absence of a new peace deal, violence and atrocities will continue unabated. In the year since the signing of the Darfur Peace Agreement, peace remains elusive, the two main rebel groups that refused to sign the agreement have splintered into a handful of factions, and, the ruling NCP continues to pursue a military campaign in Darfur. Rebel leaders -– largely because of divisions and internal disputes -– are not yet in a position to enter into negotiations. Many in the Sudan Liberation Army (SLA) are still trying to organize themselves politically at a conference in North Darfur, despite fears of being bombed by the NCP. In a recent discussion with ENOUGH staff, an SLA leader cautioned that "the NCP doesn’t implement anything it signs up to. Peace is not just a piece of paper, and we are not going to be part of any negotiations until there are international peacekeepers on the ground to assure the protection of the people of Darfur." The Government of Sudan has repeatedly violated an international arms embargo established under UN Resolution 1591, banning Sudan from transferring any weaponry to Darfur without Security Council permission. Confirmed in a recently leaked report by a United Nations Panel of Experts, the government has also been painting its deadly Antonov planes and helicopters white in order to resemble UN or AU aircraft, a breach of international law that endangers humanitarian operations on the ground. These planes continue to attack rebels and civilians, in direct violation of the ceasefire. "What we have seen so far may still just be the beginning", warned a Sudanese activist, "There’s a real danger that the IDP camps will become militarized, the government will move against the camps, and the situation will become much, much worse." Moreover, the Government of Sudan has instigated a new campaign of violence and destruction in Darfur. Janjaweed militias have received direct orders from Khartoum to broaden their targets. Previously, the militias focused their attacks on non-Arab tribes such as the Fur, Zaghawa, and Massaliet. Now, however, Janjaweed are attacking other Arabs, and violence between Arab communities is escalating – mostly over land that Janjaweed leaders have demanded as compensation from Khartoum for the services rendered over the past several years. Fighting has occurred between Targam and Northern Rezeigat tribes – both Arab tribes who have supported the NCP agenda in Darfur – and tensions are increasing amongst the Gimr in West Darfur. The DPA has not achieved peace in Darfur, and in fact, the UN recently announced that the DPA was leading to more violence. Antoine Gerard, of UN OCHA stated, "We have seen a progressive deterioration of the situation in Darfur since May 2006. For the humanitarian community it’s a nightmare. It’s a nightmare in terms of security. It's a nightmare in terms of designing your humanitarian response." The U.S., African Union, and other external actors refuse to acknowledge the DPA’s failure and support efforts to push forward with its implementation. The NCP is selectively implementing the aspects of the DPA that reinforce the status quo, and keep non-signatory rebels out. Khartoum has filled practically all the political positions allotted to the Darfur rebels, despite the fact that only one rebel group signed the agreement. In mid-April, it also formally launched the new regional administrative body created in the peace deal, the Transitional Darfur Regional Authority (TDRA). The TDRA is mandated to oversee implementation of the agreement, but with the NCP refusing to implement any of the meaningful security, wealth sharing, or power sharing provisions, the TDRA is little more than a tool for continued NCP divide and rule. At the same time, the NCP refuses to implement any of the provisions that would diminish its ability to wage war in Darfur, such as dismantling the Janjaweed. As a prerequisite to successful peace talks and a durable agreement for Darfur, the rebel factions need to agree on a common negotiating platform. Over the past six months, some of the rebel commanders have initiated internal negotiations to achieve greater unity in Um Rei, North Darfur. Despite promises to allow these unity conferences to take place, the NCP again bombed rebel locations at the end of April, killing dozens of civilians. The rebels, for their part, have retaliated, bringing down a government helicopter. After refusing to respond to a summons issued for Ahmed Haroun (State Minister for Humanitarian Affairs) and Ali Kosheyb (a militia leader), the ICC issued formal warrants for their arrests in early May. As with the summons, the government of Sudan rejected the jurisdiction of the ICC, despite the UN Security Council Resolution 1593 [link to glossary] referring the situation in Darfur to the ICC in March 2005. The main challenge hampering progress in Darfur has been the international community’s tunnel-vision focus on a beefed up peacekeeping force in the region -– at the expense promoting a durable peace. Pressure from the international community, particularly from the U.S. and the UK, had been building over the past few months, in an attempt to accelerate the NCP’s acceptance on the three-phase support package to the AU Mission in Sudan – particularly on an AU/UN hybrid force. Consensus was growing in the EU over sanctions, movement was being made in the Security Council regarding a list of individuals, and even China was having harsh words with the NCP leadership. As in the past, the NCP started to respond to the pressure –- and the UN requested for the world to wait on sanctions. On April 16, the world got its response –- with the NCP sending an official letter to the UN, agreeing to the second phase of assistance (the Heavy Support Package). What is the Heavy Support Package? 2,250 military personnel – These are not infantry troops, but are personnel who can provide logistics, communications, and other basic support to AMIS. They will also include helicopter pilots and military tactical staff. Some in the international community regarded this letter as a great diplomatic "success," but in reality, little has changed. Although the technical details of the package have now been clarified, the NCP had already agreed to the Heavy Support Package several times –- with the first time being last November. Delay after delay has now meant that it is unlikely that the Heavy Support will be on the ground before the end of the year. There has still been little concrete forward movement on the AU/UN hybrid force. UN Secretary General Ban Ki-Moon and UN Special Envoy Jan Eliasson have asked the international community –- and specifically the EU and the U.S. –- to hold off on imposing sanctions in order to allow more time for diplomacy to yield positive results. This merely repeats a pattern that has bedeviled international efforts in Darfur over the past four years: the constant turnover of senior officials who are not familiar with Khartoum’s diplomatic games plays directly into the hands of the regime, and innocent civilians continue to suffer. Up until now, the international community has not set concrete benchmarks of progress on either the political negotiations or the deployment of a robust peacekeeping force. Its refusal to do so implies that there is little political will to hold the NCP accountable, and that it still hopes that threats and empty words will push the NCP to take the steps necessary to ensure protection on the ground. The recent experience of the Heavy Support Package shows that it is only concerted multi-lateral pressure that will force the NCP to recalculate its position. Despite a lack of benchmarks, the EU and the U.S. agreed at their latest EU-U.S. Summit that "if no progress on a political solution or on the implementation of the hybrid-mission is achieved soon, we agree to support initiatives by the UN Security Council to work on a new Security Council resolution that imposes multilateral sanctions against individuals and Sudanese entities, extends the arms embargo and establishes the capacity to monitor and report on offensive flights that are inconsistent with the UNSCR 1591." But in order to make this possible, the U.S., UK and France will need to make sure that China is in agreement. To date, China has played a destabilizing role, supporting the. Only recently has China become more supportive of the AU/UN initiatives, and on May 10 China appointed its own special envoy for Darfur. China does not typically appoint special envoys, and the decision to do so indicates that Beijing is losing patience with the Khartoum’s unwillingness to resolve the crisis. Part of this policy shift can be attributed to the Chinese government’s realization that the Darfur situation is threatening overall security in Sudan. More importantly, however, is growing public attention on China’s support for Khartoum and the 2008 Olympics in Beijing. Fears that the 2008 names be remembered as the “Genocide Olympics” are altering China’s calculations, but it is too soon to know precisely how far Beijing is willing to go to halt atrocities in Darfur. Peacemaking: The United States, the European Union, and the African Union should assemble a team of diplomats based in the region to work full-time on unifying the rebel groups. At the same time, the United Nations and the African Union must develop a framework and roadmap for renewed negotiations between the government and the rebels, and must put the proper personnel in place immediately to resume the peace process. The international community needs to devote more diplomats and resources behind efforts to unify the rebels. There also needs to be a roadmap for negotiations between the rebels and the Government of Sudan. The AU/UN mediation team should establish a clear division of labor and work with other regional and international actors to generate support for the new peace talks. The U.S. should play a major role in shaping this strategy together and making sure the right personnel are in place to move the various elements forward with appropriate urgency. greater power sharing for the people of Darfur. The negotiation process itself should be strengthened, reflecting the model that led to the signing of the Comprehensive Peace Agreement in January 2005. These talks had a small, well-run mediation team, with selective international involvement, including from a high-level U.S. envoy, the Secretary of State and President Bush himself. For a durable peace agreement, future talks must be more inclusive and should include representatives from key Darfurian constituencies left out of earlier talks. This can be accomplished by putting in place a mechanism at the talks through which representatives of Darfur's Arab tribes, displaced persons, women, and civil society can have their voices heard. For a detailed analysis of how to build a durable peace process for Darfur, see Crisis Group’s latest report. Protection: The United Nations must work in close coordination with the African Union to line up the forces necessary to reach the 20,300-troop level agreed upon in November by the AU, the UN, the Arab League, and international donor countries, and then must place renewed pressure on the NCP to fully accept this "hybrid force." The international community must also accelerate its contingency planning for military action if the situation worsens, including plans for a no-fly zone and intervention in the event of large-scale massacres of civilians. Further pressure must be placed on Khartoum to accept the AU/UN hybrid force. Until then, donor countries must continue to fund the AU mission at full capacity and NATO members should help to build the capacity of the African Union. The United States and France should put pressure on Deby to accept the UN deployment of peacekeepers to protect civilians and humanitarian operations in eastern Chad, in conjunction with genuine political dialogue between the government and internal opposition groups. If the situation continues to deteriorate in Darfur, the Security Council should have plans in place to deploy ground forces to the region with a mandate to stop the killing, even in the absence of Khartoum’s consent. Although the international community's appetite for this type of military action is small, the Sudanese government must understand that all options remain on the table, and this will be a point of leverage in pressing primary objectives forward. Punishment: The U.S. must lead the international community in altering the pro-war calculations of Sudan's ruling National Congress Party by working to impose multilateral punitive measures — such as targeted sanctions and economic pressures — against senior NCP officials and the companies they control. Such efforts must also target rebel leaders obstructing peace and perpetrating atrocities. Additional assistance also must be given to the International Criminal Court to execute indictments, support the prosecution of indictees, and help accelerate the Court's preparation of additional indictments against senior Sudanese officials and the Janjaweed militias. The U.S. needs to stop sending mixed signals to Sudan. While on the one hand the U.S. has declared the crisis in Darfur genocide and President Bush has threatened to implement a so called “Plan B” (made up largely of inadequate unilateral sanctions), a recent State department report described Sudan as a "strong partner" in the war on terrorism. Until the U.S. reconciles its policies and implements a Plan B with teeth, the NCP will not take U.S. threats seriously and will not alter its course in Darfur. urge President Bush to impose targeted UN Security Council sanctions against persons responsible for crimes against humanity in Darfur and Sudanese companies already sanctioned. impose targeted UN Security Council sanctions against persons responsible for crimes against humanity in Darfur and Sudanese companies already sanctioned unilaterally by the U.S.
Sudan’s oil revenue continues to fuel the genocide in Darfur by providing funds that support the perpetrators of atrocities. Through its mutual funds, Fidelity has been a major investor in oil companies that operate in Sudan, and it continues to increase its holdings. Join Fidelity Out of Sudan in calling for Fidelity to stop investing funds in companies that are fueling the genocide in Darfur. For more information, go to fidelityoutofsudan.net. Join activists in pressuring China to stop under-writing the genocide in Darfur. Find out about the Olympic Dream for Darfur Campaign’s three-part strategy—a symbolic Olympic Torch Relay from Darfur to Beijing, a grassroots mobilization campaign, and a letter writing initiative -— at dreamfordarfur.org. China must know that it cannot legitimately host the Olympics while being complicit in genocide. Gareth Evans and Andrew Stroehlein, "A Responsibility to Protect: The World's View," Open Democracy, April 5, 2007. Nadim Hasbani, "About the Arab Stance Vis-à-vis Darfur," Al-Hayat, March 21, 2007. Nick Grono and Donald Steinberg, "Future of the World Court in Balance," YaleGlobal Online, March 8, 2007. Omer Ismail and Colin Thomas-Jensen, "Nations Must Enforce Darfur Peace Agreements," The Boston Globe, February 10, 2007. Colin Thomas-Jensen, "How Joe Q Citizen Can Affect Darfur," Fort Worth Star Telegram, January 9, 2007. John Prendergast and Colin Thomas-Jensen, "Blowing the Horn," Foreign Affairs, March/April 2007. Learn more about Global Public Opinion and the Responsibility to Protect, from a meeting held at the Brookings Institution discussing international support for the Responsibility to Protect. See how the Sudan Divestment Taskforce is spearheading a nationwide movement to divest money from a targeted list of companies underwriting mass atrocities in Darfur. 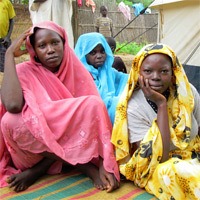 Learn whether your congressional representative has done enough to end the crisis in Darfur by reading his or her score card at www.DarfurScores.org. Read about China's role in underwriting the ongoing genocide, and join the effort led by Professor Eric Reeves to stop the "Genocide Olympics" at www.sudanreeves.org. Go to Reuters AlertNet for the latest humanitarian developments, and see how organizations such as the International Rescue Committee and Oxfam are responding.